Rachel Notley says that former conservative voters will be key to the direction of Alberta's future. As the election campaign moves into its final days, Notley appealed to voters who might not have been with her in 2015, but want to join her to create jobs, build pipelines and diversify the economy while defending the things that matter to families. 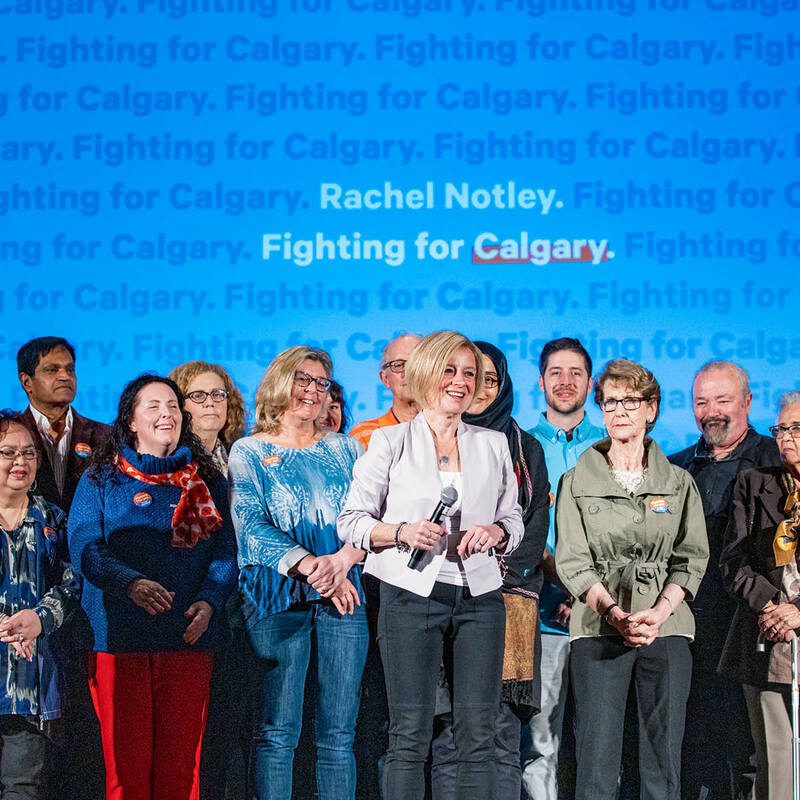 She was joined on stage by dozens of former PC voters who say they can't trust Kenney and see Notley as a strong leader. Brian Bietz, a 66-year-old Calgarian, announced his support for Notley after a lifetime of campaigning and voting PC. Bietz's daughter, Julia Bietz, is running as the NDP candidate in Calgary-Lougheed. Bietz says he hasn't agreed with every decision Notley has made, but he's watched Kenney's politics and worries about his "risky" economic plan and willingness to "play loose with the truth." Notley said the decision on April 16 will be who is the right premier to do the job. “You may have concerns about Mr. Kenney and the choices he will make," said Notley. "It might be the extreme fringes or the fact his campaign is being investigated by the RCMP. I appeal to you directly to join us." Notley said her vision for the province is built on shared core values and a government that understands the need to invest in our strengths. While Kenney has promised to wage war on the rest of Canada, Notley said that a plan for the future will depend on new ideas, innovation and entrepreneurship. Alberta can choose to get left behind, or it can decide to lead. Albertans are worried about the economy, Notley said. It's been tough on many people, particularly in Calgary. But she vowed to continue fighting for the Trans Mountain pipeline, to attract $75 billion in private investment in upgrading and refining. She will also continue making Alberta attractive to investments in high tech, agriculture and renewable energy. Notley said she will balance the budget without sacrificing schools or Alberta’s public health care system, or increasing costs for seniors. For Bietz, Kenney's politics have represented something "I just don't like to see." He's had difficult conversations with friends and family about the future of the province. Albertans might be frustrated, Bietz said, but Kenney's solutions amount to little more than a temper tantrum. Having worked on many PC campaigns, Bietz said Kenney does not represent the party of Peter Lougheed and Ralph Klein. Kenney's vows of court battles and a referendum will win headlines but little else. He has no plan to maintain health care services or education, handing away billions of dollars to corporations when Alberta already has the biggest tax advantage in Canada. Bietz says Notley has fought like Lougheed and is "one of us" like Klein. Notley vowed to continue fighting for Calgarians like Bietz and for the province as a whole. "In Alberta, we don't have to hurt people, we can have each others' backs," Notley said. "We can build an economy for the future and take care of each other."